RSS stands for Really Simple Syndication, and refers to a format used to provide information about frequently updated content on the Web. An RSS feed is a file that, when read by special program, displays summaries of new or recently updated web content together with links to the full versions of that content. 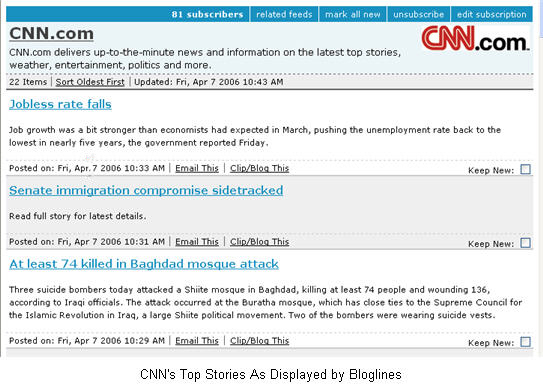 RSS is often used by news websites to provide headlines for the latest news. Each headline includes a brief summary of the corresponding news story, along with a link that can be used by the reader to view the full version of that story. 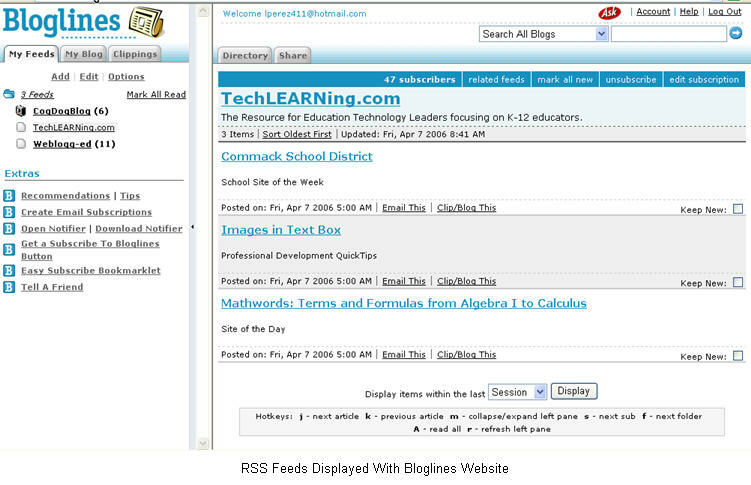 RSS can also be used to list the most recent updates to any website, including blogs and wikis. The subscribers to a blog’s RSS feed can click on the links below each summary to read the entire content of each new blog entry listed in the RSS feed. RSS is also a key component of podcasting. In order to have a podcast other people can subscribe to, you must create an RSS file that has some information about each individual episode. The RSS file can include the episode’s title and a link to the audio or video files that will be downloaded when you subscribe to the feed for that podcast. 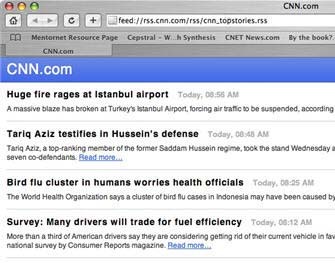 You can see an example of an RSS feed by visiting this page on the CNN web site using Safari, the web browser included in OS X.
Safari has a built-in RSS reader that can understand the special formatting used to create an RSS file. 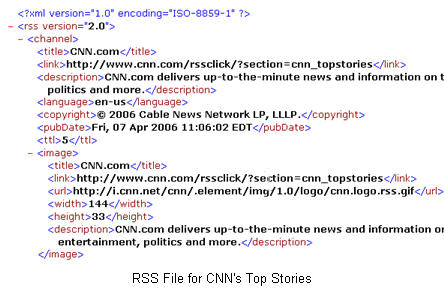 RSS files are formatted using a special language called XML. If you open an RSS file with a web browser that does not understand that format, such as Mozilla Firefox, all you will see is code. In order to view the content of an RSS feed, you must use Safari, or you can use an online service such as Bloglines or Google Reader to manage and display RSS subscriptions. All you need to do to use Safari to open an RSS feed is to type in the address of the feed in the address line and press Enter. Safari will open the RSS feed and display it in a browser window. Safari will even let you know when you are visiting a site with an RSS feed by displaying a blue RSS icon in the address bar, to the right of the site’s URL. You can just click on that icon to open the RSS feed in the browser window. On the right hand side of the window, you will see a search bar you can use to search through the different articles listed in the feed. You can also use a slider to change the length of the summaries displayed by the RSS feed. You can use this slider to increase the number of headlines you can display on one page. Other options include the ability to sort articles according to different criteria, such as by date or by title. You can also change the view to display only items from the last seven days or from last month. Safari allows you to bookmark RSS feeds the same way you can bookmark web pages. As a teacher, you can use RSS to stay up to date on the latest developments in your field. Many of the professional organizations and publications in the field of education have RSS feeds available on their websites. One thing you can do with Safari’s RSS reader is create your own personalized clipping service. To do this, enter a search term in the search area while you have an RSS feed displayed, then bookmark the results of that search. Safari will automatically update your bookmark as new articles matching your search criteria are added to that feed.